In case you have an unscheduled meeting you can use a free meeting for minuting. It is not necessary to add an attendee group. You are able to use all regular functions as well. Choose „View Meeting minutes“ in the sub-menu „Meeting Minutes“ 1. You will get a screen with an overview of all meeting minutes. 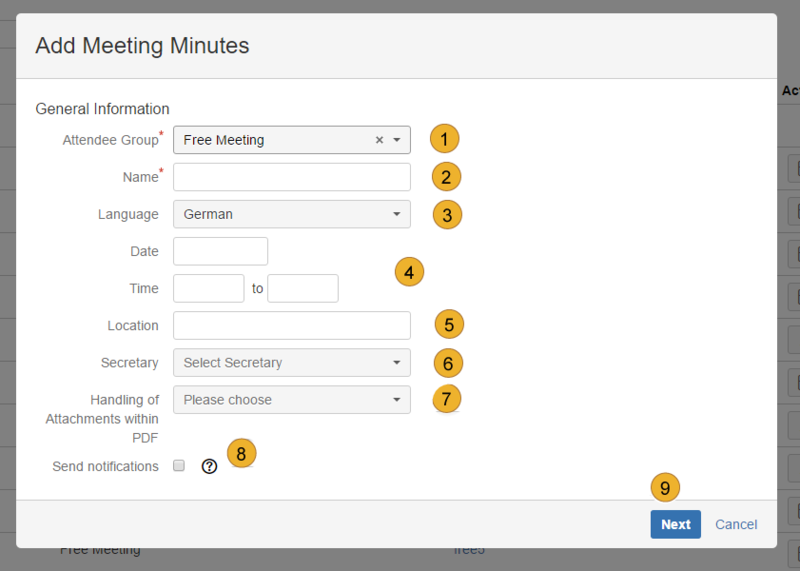 To add a new meeting minutes, click the button „+ Add meeting minutes“ 2. Now you can set the „General Information“. Start with Attendee Group 1 and choose “Free Meeting”. Now add Name 2, Language 3, Date and Time 4, Location 5 and the Secretary 6. Furthermore you are able to choose the handling of attachments within PDF 7. Sending a notification 8 to all internal and external participants after closing the minutes is possible as well. In the secretary pulldown menu only users assigned to the meeting secretary role within the current project are shown. Click “Next” 9 to proceed. The next steps are equal to add meeting minutes with attendee groups.